If iPhone is not synchronizing Calendar events with Outlook, try the free Sync2 Cloud software. With Sync2 Cloud you can sync iPhone Calendar events with Outlook and after synchronization you can access and edit events either in Outlook or on iPhone. When Outlook Calendar and Contacts are not syncing with iCloud and iPhone, you can solve this issue using Sync2 Cloud. 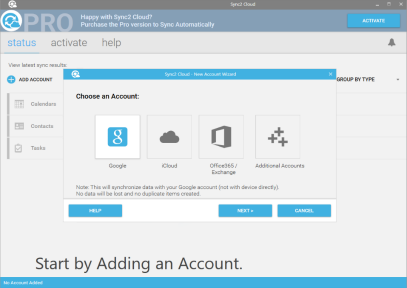 Sync2 Cloud will sync Outlook Calendar and Contacts with iCloud wirelessly and without using iTunes. 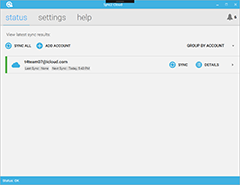 If you want to fix a synchronization problem between iPhone and Outlook, the free Sync2 Cloud software is a great solution. Sync iPhone Calendar and Contacts with Outlook without any problems. Repeat steps 3-6 to add Calendars or Contacts from other iCloud accounts, if you want to sync Outlook with multiple iCloud accounts. In a few moments iPhone and Outlook will be synchronized.